You've probably heard of the term travel hacks but do you really know what it means? 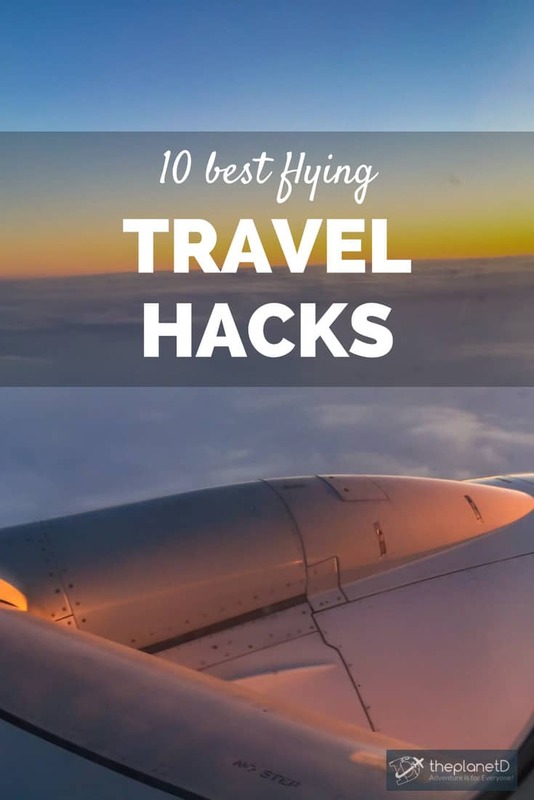 It's simple really, travel hack is a term used to describe tips, tricks and tools to help travellers save money and make the most of their vacations. We've partnered with KAYAK to help them collect the best travel hacks from the experts to give you the inside scoop for this holiday season. 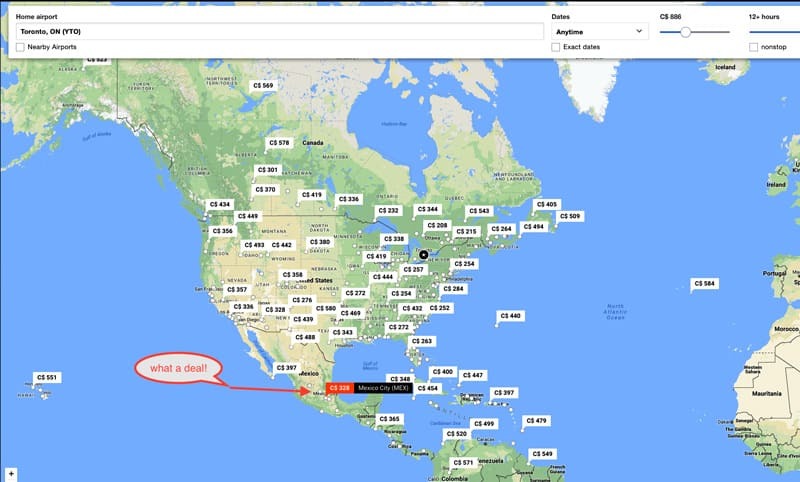 KAYAK searches hundreds of travel sites to get information travelers need to book the right flight, hotel rental car or vacation package. Let's start with booking your flights and how to save money. Explore is an amazing feature that we just found out about through KAYAK and love playing around with it! If you are like us, you are open to traveling anywhere. Sometimes you just don't know where you want to go. So instead of making a choice, punch in your budget and see all the amazing places you can fly to within that price range. You can even filter by flight length to find the perfect spot. If you are from Toronto, and want to go to the Caribbean you can check out flights that have a 3-4 hour flight duration and see where it will take you. Want a place in Europe instead? Punch in 6-7 hours. I love having choice and flexibility and will be using this for our winter vacation. Airports are not fun places to be anymore. They're crowded, lines are long and people are rushing from one place to the next: especially during the holidays. Avoid the queues by checking in online. That way you can bypass the check-in counter and go directly to the gate. 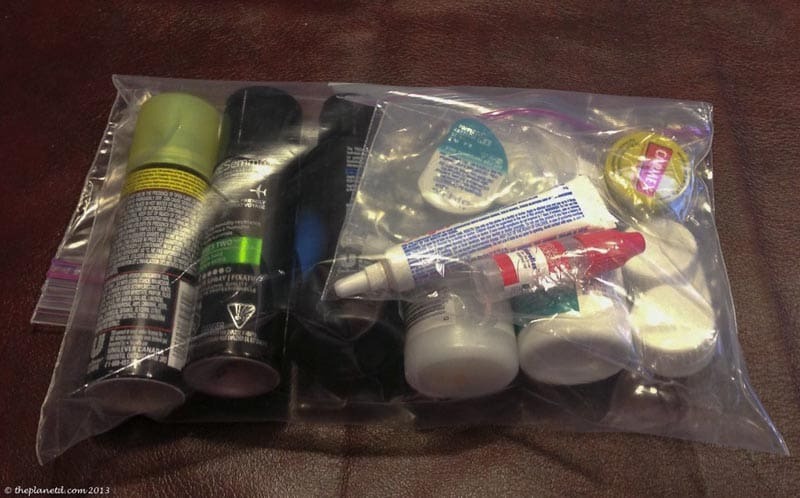 This travel hack works particularly well if you travel carryon only. If you don't have to check your bags, you can walk directly to security. Don't worry, if you do have to check bags, there is usually a dedicated counter for bag drop off and you will still save a lot of time. Checking in online also gives you a head start for choosing seats. Other people have to settle for the leftovers at the counter, but you can pick what you want from the seating plan online. We suggest heading over to Seat Guru before choosing your seats. It has already done the hard work for you breaking down seat descriptions for every plane on every carrier. You can look up what has the most legroom what's most comfortable, how the service is and whether or not the seat have power. It's amazing! 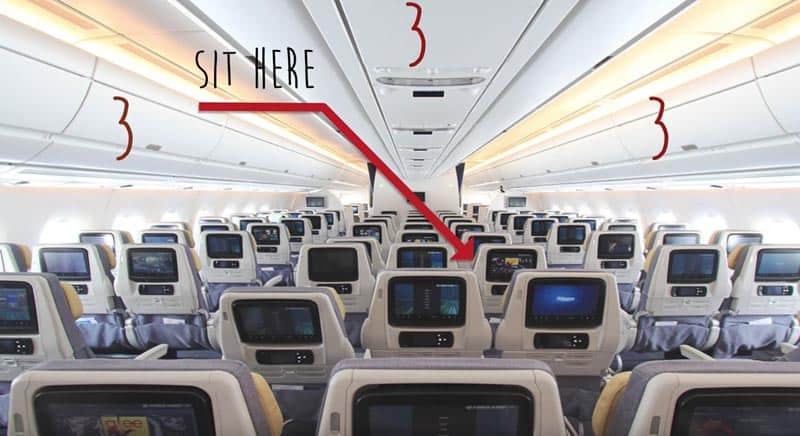 When choosing seats, we always recommend sitting near the front. When you sit near the front you are first off the plane when you reach your destination putting you near the front for immigration and when flying you are served food and drinks first. Being near the front has its benefits. 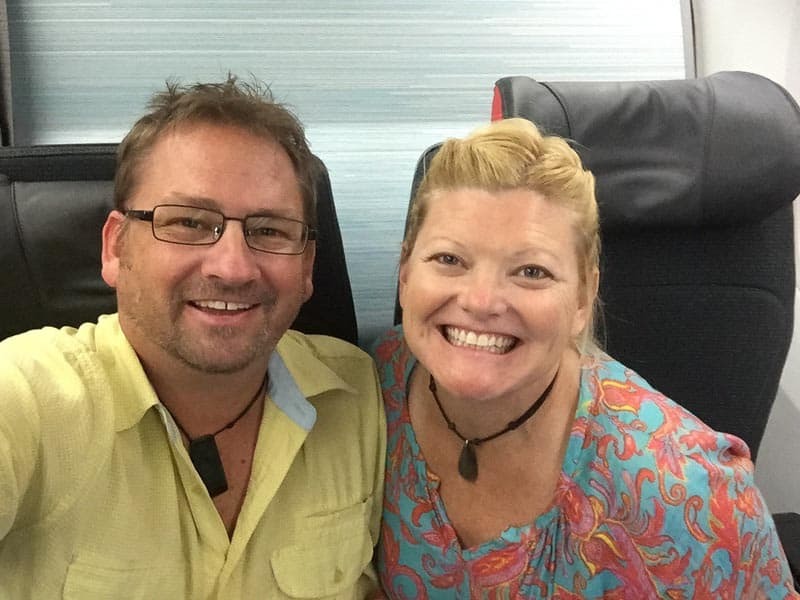 When travelling as a couple there are a few things to take into consideration when flying. If you are in a 3-3 configuration and think that the flight won't be sold out, we highly recommend booking a window and an aisle seat leaving the middle seat open. Chances are people will choose a different seat if they see they have to sit in the middle. Especially if you have purchased an upgraded seat. Many planes have premium seats available for a small fee. If you are traveling together, you can pay for a window and aisle in the premium seats and it's highly doubtful that someone will purchase a middle seat. We've made the mistake of booking an aisle and middle thinking we should stick together only to see every other couple around us at a window and aisle with their middle seats empty. Naturally, the single passenger saw our window seat available and jumped on it. We learned our lesson immediately. If you are sitting in a 3-4-3 or 3-3-3 configuration, take that middle set of seats. That way you won't have to worry about disrupting a stranger to get out of the seat or have to worry about someone disturbing you when they need to go to the bathroom. Dave always takes the aisle since he's bigger than me and it gives the feeling of a little more space. If he is sleeping, I just climb over him instead of bothering the person on the other side of me. I could never do that with a stranger. I cannot tell you how many times in the past, I have been in the window seat and the person on the aisle is sound asleep. I don't want to wake them, but I am on the verge of bursting. It's not a fun feeling. If you have a flexible schedule, you can save a lot of money by being flexible on departure and return dates. 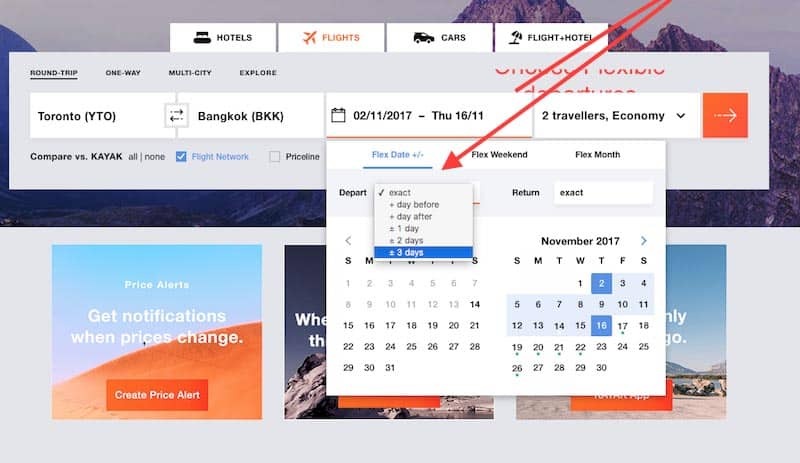 KAYAK shows you how much money you’ll save by having flexible arrival and departure dates of up to 3 days on either end. If you can swing it, it's worth changing your travel dates to save a lot of cash. We've seen differences of hundreds of dollars just by leaving a day later or earlier. I love the fact that KAYAK does the work for you and you don't have to constantly punch in your different dates of departure to check for options. Continuing on with being flexible, set up a Price Alert on KAYAK. How often have you heard of people telling you that the best day to buy a flight is on a Tuesday at midnight or to avoid a Sunday at the beginning of the month. Who can keep track? 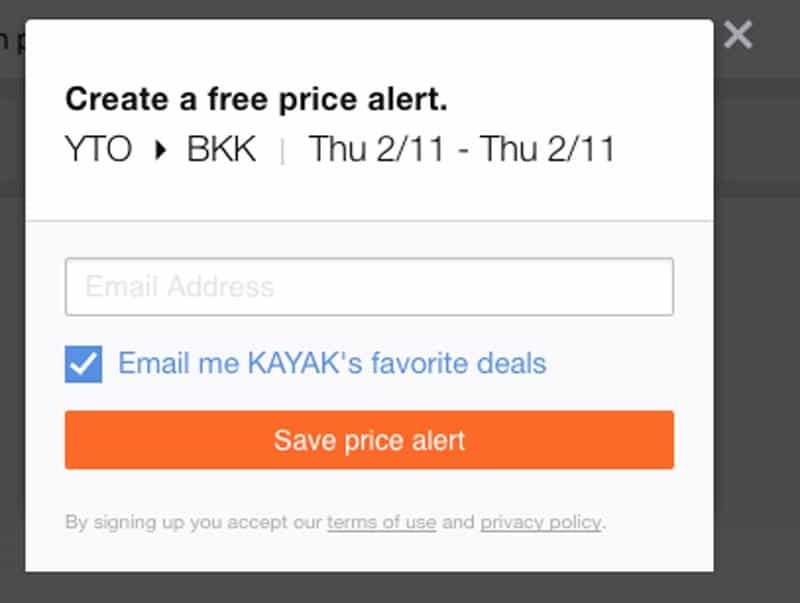 When you sign up for price alerts, you will receive customized alerts from KAYAK to let you know when prices change for a flight or hotel. Or use the Holiday Hacker Guide, it shows you the best time to book our flights and takes the guessing out of it. You can choose if you want the alert to go directly to the KAYAK app on your phone or straight to your inbox. How great is that? If you have your eye on a trip but can't quite afford the price, you can wait and see if it will come down to your budget. Travel can be very uncomfortable these days. With shrinking seats and dwindling leg room, it's nice to have a bit of comfort from home. We carry a care package of goodies to make life easier on the flight. When boarding the plane, I keep my fully stocked care package separate from my carry on, so when I board, I can quickly put my carryon bag over head and drop into my seat with everything I may need. Our care package consists of. Sweater for Dave, silk scarf for Deb – temperatures constantly fluctuate on the plane, it's good to have layers. Advil, allergy medication and Advil cold and sinus – it's amazing how often an allergy is triggered or I feel stuffy on a plane. iPhone stocked with our favourite TV series, book or music – We've had many a trip where our entertainment system didn't work. Collapsible water bottle filled with water from the tap after entering security. If you want to be served dinner fast, order a special meal. There are plenty of options these days for meals and they usually bring the special meals to passengers before doing the complete dinner service. If you want the regular meal, sit near the front as flight attendants serve front to back first. There is nothing better than getting out of the hustle and bustle of the airport to retreat to the quiet comforts of a lounge. During the holidays airports are particularly chaotic. Having lounge access takes you away from the noise and crowds where you can enjoy a glass of wine, free Internet access and a quiet space before boarding. Not everyone has the frequent flier perks for lounge access, but there are other ways to get into lounges. Our favourite is Priority Pass. There is a yearly fee, but you have access to lounges in 600 airports around the world. 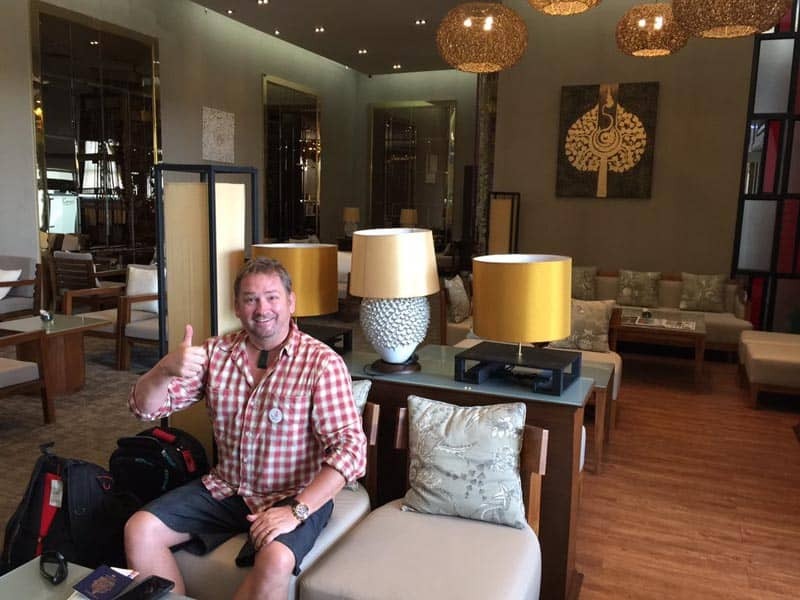 We have found Priority Pass lounges are often better than the airline specified lounges. Another excellent way to get lounge access is to enroll in a Rewards Credit Card program. Check with your home airport to see what dedicated credit card lounge they have. At Toronto Pearson, there is an American Express lounge that certain card holders have access to. Another bonus is that American Express card also gives front of the line access through security. All airports are different so check what credit card works best for your airport and your travels. We have seen certain Visa cards offering lounge access, there's EnRoute, and Mastercard. Not all credit cards are created equal, so look into the specifics before signing. People mix up bags regularly at baggage claim. Don't make it easy for someone to walk off with your bag because it looks exactly the same as theirs. When you buy a generic black bag, you will look like every other bag out there and it's easy to get mixed up. I have seen it happen more than you would think! Instead ,buy a bag that stands out. Buy an orange bag or a bag with a cool pattern. Or better yet, buy an ugly bag. Nobody will want that! If you already have a black bag and don't want to buy a new onespruce it up to look unique with a luggage band that you can buy at any luggage store or online or colourful luggage handles to set it apart from other bags. We have unique luggage already, but we still put green, red and blue wraps on our luggage handles. They even have a spot for our name and address should our luggage get lost. So there you have it. Those are our favourite travel hacks to help you navigate the holiday season. Do you have a good insider tip you'd like to share? Tweet us at #KAYAKTravelHacker with your best advice! 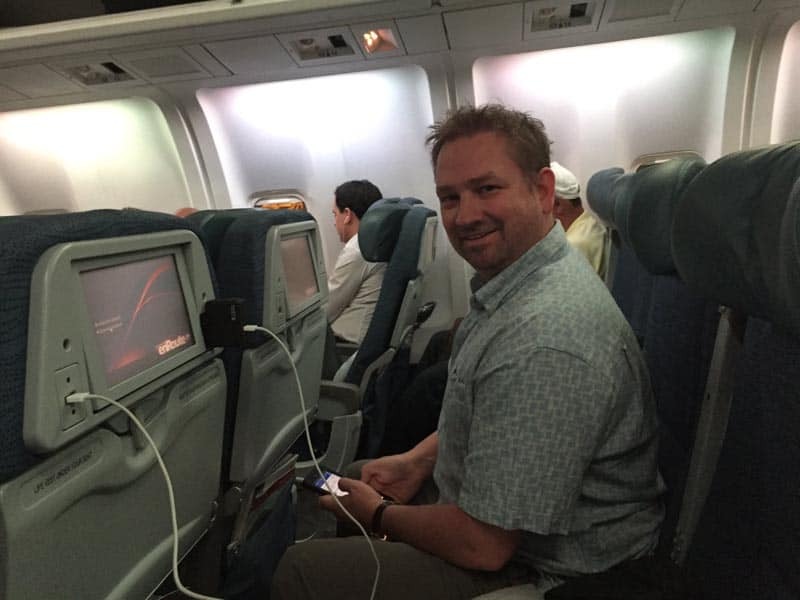 26 Responses to "10 Best Travel Hacks for Flying"
Thank you for your advice. This is a nice overview of travel hacks. Some of them might look obvious but the truth is that I didn’t think of them so far! 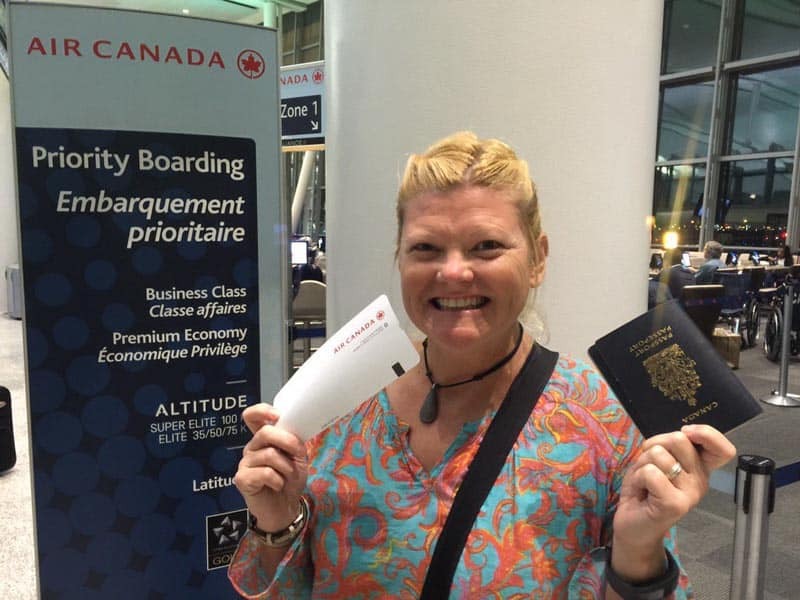 Great post – will use these as I go to South America for the holidays! I love the couple travel hacks, especially which two of three seats to take, that is brilliant! From my own experience: prior to the trip, I adjust my sleep schedule by an hour each night until I’m on the same schedule as the time zone I’ll be going to. During the trip, bring melatonin if it’s an overnight to help with sleep. After the trip, dark chocolate really helps with jet lag. It’s also a great treat if you arrive to a stressful destination. Great travel hacks!! Saw some I already do and learned a couple of new ones hat will come in handy, specially with holidays around the corner and all the flying that means for me! A travel hack that has worked for me in the past has been to wait to check in online to get good seats. 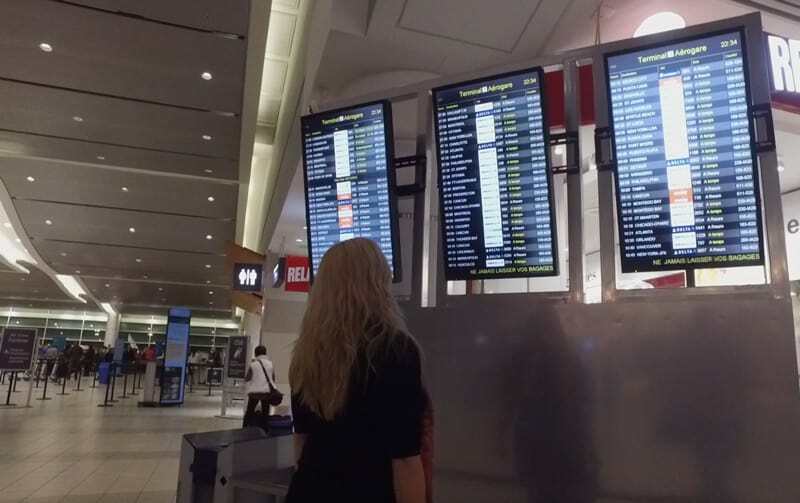 Not every airline company allows you to select a seat without paying a hefty fee so by waiting a couple of hours after check in opens you leave yourself with a higher chance of getting a good seat free of charge. 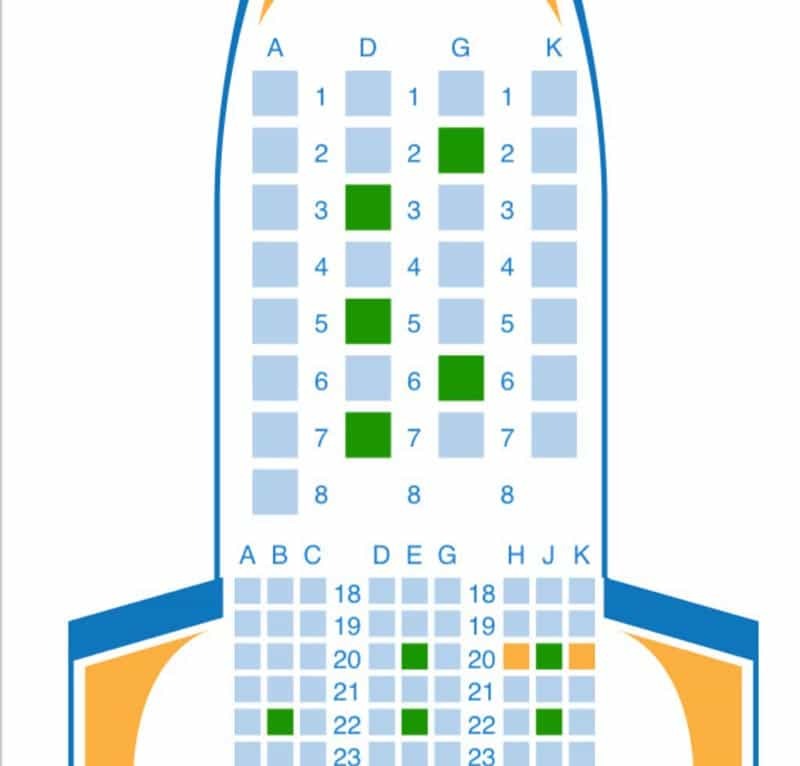 The algorithms for random seat allocations focus on getting all the seats filled from back of the plane to the front, so if you wait a bit the seats in the front will be the ones available and you will randomly get one of those allocated to you. Works great for budget airlines in Europe! That’s a great tip! thanks for sharing. My favorite travel hack is having a unique bag. Years ago I took multiple strands of brightly colored yarn wove them together and attached them to my bag in several places. Makes spotting my bag very easy. Yes, that’s definitely a good one. There are way too many black generic bags out there. These are great! Especially the couple one! I have one great travel hack that I use pretty often to get priority boarding. Go up to the boarding counter before they open the gate and tell them you are traveling with thousands of dollars of camera equipment and ask if it is possible to board early so that you can make sure to have your gear close by in overhead storage before it fills up. 9 times out of 10 they will give you priority boarding. If you’re on a budget and are seated in non-priority economy, it’s a great way to keep your stuff safe and get settled in early! Oh wow, that’s a good one. Thanks for the tip! Great tips! Would like to add one more. Make sure you aren’t sitting right before the emergency exit. Often the seats in emergency exit can’t be reclined. Great advice. We just had that on the way to California last week. It was an awful 6 hour flight with no reclining seats. The worst! My favorite travel hack is kayak explore, though I usually end up just using to daydream instead ? 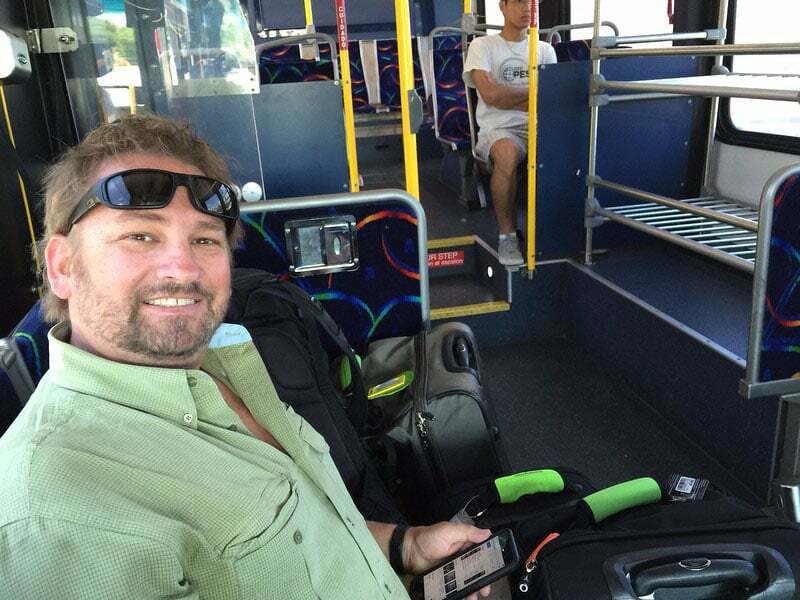 For multi leg trips that vary in style from an quick moving explorer tour to a long hotel stay, I have a bag that has both wheels and option for backpack straps. I can wheel it comfortably through the airport and chuck it on my back to climb up to our bamboo bungalow. That is an excellent tip. I like having the backpack option as well as being able to wheel as well. Thanks for sharing! I bring my kindle and read my flights away ? Time goes by so beautifully when you are reading a good book! My favorite travel hacks aretraveling during the off-season and carry-on only, always! Also helpful to have a copy of the prescription for any prescription meds in case they ask at security. You share hacks that can help you find a more luxurious or easier way to have a good holiday. Go on a trip without electronic and technical gadgets? It’s now unthinkable! Thanks to these surprising tips and tricks, you will travel without worry. Are you lost without Wi-Fi? Incredible, but true: some parts of the world are not yet equipped with wireless internet. But did you know that, with some preparation, you could also surf offline on Google Maps? Find the area you want to surf without Wi-Fi and type “ok maps” in the search bar. The visible part of the map is thus saved for later use! Modern travelers do not leave without an impressive arsenal of chargers, cables, and plugs. Have you forgotten the adapter for the American plugs? Do not panic: today, most hotels are equipped with flat-screen TVs with built-in USB ports. You will be sure to recharge your smartphone! Are you afraid of losing your camera at a party? As soon as you use a new memory card, take a selfie. You can prove to the lost property service that the device belongs to you. Be sure to be recognizable in the picture. Are you looking for free Wi-Fi to put your holiday photos on Facebook? Check out the Four Square social network. Users are generally kind enough to indicate in their comments what they think of the wireless Internet available in this or that bar. With a little luck, you will also find the password to surf for free! Great tips! The lounge access one is huge for us. Just having a little bit of time to relax from the hustle and craziness of long travel days is so beneficial. Agreed. When you travel a lot, lounge access becomes more important. But it is also a perk for people who don’t travel so often as well. If you can splurge on a lounge at the beginning of your vacation, it starts at the airport rather than once you land 🙂 . With things like Priority Pass and other credit card lounges, non-frequent fliers now have the opportunity to enjoy all the perks too! These tips are so insightful and I can imagine that they will come in very handy. The one about traveling as a couple is so simple, yet so genius! I am definitely trying that one out next time. Thank you for the tips! Thanks! I am glad you like that one. For long flights especially, Dave and I dont mind not having a window view. It’s so much easier to just step over Dave if I have to go to the bathroom. I actually just did that last night flying to Bangkok. He was sound asleep and I crawled over him. haha. If he were a stranger, I’d have to wake him up and feel awkward.